In other traditions, Huike was a famous general who had killed many people in battle. One day, though, he realized that the people he had slain had family and friends who might one day kill him in retribution. Shénguāng decided to ordain as a Buddhist monk and he became a great speaker on Buddhism. He eventually made his way to the city of Nanjing, the capital of the southern Chinese kingdom of Liang. Shénguāng was speaking to a large crowd of people in the Flower Rain Pavilion when Bodhidharma happened by following Bodhidharma's failed audience with Emperor Wu of Liang. 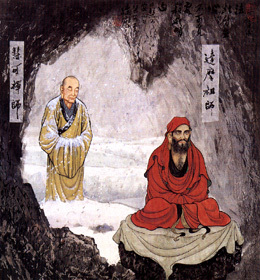 Bodhidharma listened to Shénguāng's speech. Sometimes Shénguāng would speak and Bodhidharma would nod his head in seeming agreement. Sometimes Shénguāng would speak and Bodhidharma would shake his head in apparent disagreement. As this continued, Shénguāng became angry at the foreign upstart monk who dared to disagree with him in front of the crowd. Shénguāng took the Buddhist beads from around his neck and flicked them at Bodhidharma. The beads struck Bodhidharma in his face, knocking out two of his front teeth. Bodhidharma immediately began bleeding. Shénguāng expected a confrontation. Instead, Bodhidharma smiled, turned, and walked away. Shénguāng was astounded by Bodhidharma's reaction and followed after him. Bodhidharma continued north until he reached the Yangtze river. Seated by the river was an old woman with a large bundle of reeds beside her. Bodhidharma walked up to the old woman and asked if he might have a reed. She answered that he might. Bodhidharma took the reed, placed it upon flowing surface of the Yangtze river, and stepped onto the reed. He was ferried across the Yangtze river by dint of his chi, virtue of his mindfulness, and his mastery over inner winds. Seeing this, Shénguāng ran up to the old woman and grabbed a handful of reeds without asking. He threw the reeds onto the Yangtze river and stepped onto them. The reeds sank beneath him and Shénguāng began drowning. The old woman took pity on Shénguāng, pulling him from the river. As Shénguāng lay on the ground coughing up water, the old woman reprimanded him. She said that by not asking for the reeds before taking them, he had shown her disrespect and in doing so had disrespected himself. Shénguāng also realized the agitation and aggression of his mind, which he had carried from the Flower Rain Pavilion to the point of drowning. Though he spoke on the teachings of peace and awakening to others as a Buddhist teacher, he was still maintaining the aggression from his time in the army. A realization emerged within him that Bodhidharma was compassionately pointing out his flaw. The old woman told Shénguāng that he had been searching for a master and that Bodhidharma, the man he was following, was that master. A yearning grew within him to become a disciple of Bodhidharma's. As the old woman spoke to him, the reeds which had sunk beneath Shénguāng rose back to the surface of the river and Shénguāng found himself on the reeds being carried across the Yangtze river. He reached the other side and continued following Bodhidharma. Many people believe that the old woman by the river was a Boddhisatva (a person who compassionately delays entering nirvana in order to save others), who was helping Shénguāng to end the cycle of his samsara (the cycle of death and rebirth to which life in the material world is tied). At this point, Bodhidharma was nearing the location of the Shaolin Temple. The Shaolin monks had heard of his approach and were gathered to meet him. In some traditions, Bodhidharma was refused entry by the head abbot Fāng Chāng (方昌), who saw him as a barbarian troublemaker. In other accounts, it is said that the Shaolin monks greeted him and invited him to come stay at the temple. Bodhidharma did not accept their invitation but went to a cave on a mountain behind the Shaolin Temple, sat down, and began meditating. In front of the Shaolin Temple, there are five mountains named after the objects, which their shape resembles: Bell Mountain, Drum Mountain, Sword Mountain, Stamp Mountain and Flag Mountain. Behind the Shaolin Temple lie five "Breast Mountains." 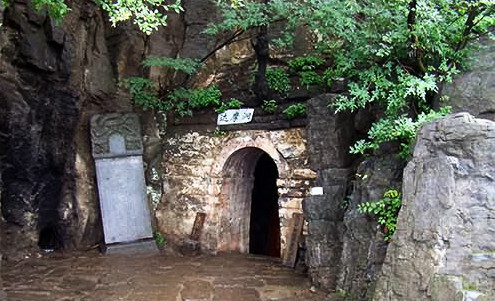 The cave in which Bodhidharma chose to meditate lay on one of the Breast Mountains. Shaolin Cave where Bodhidharma sheltered and meditated. Present day photo of the cave. Bodhidharma sat facing a cave wall and meditated for nine years. During these nine years, Shénguāng stayed outside Bodhidharma's cave and acted as a bodyguard for Bodhidharma, warding him against harm. From time to time, Shénguāng would ask Bodhidharma to teach him, but he never responded to Shénguāng's requests. During these nine years the Shaolin monks would also occasionally invite Bodhidharma to come down to the Temple, but Bodhidharma never replied. After some time, Bodhidharma's concentration intensified so greatly that his image was engraved into the stone of the wall before him. Near the end of the nine years, the Shaolin monks made a special room for Bodhidharma that they called the Bodhidharma Ting. When it was completed, the Shaolin monks invited Bodhidharma to come stay in the room. Bodhidharma did not answer but he climbed to his feet, walked down to the room, sat down, and immediately began meditating. Shénguāng followed Bodhidharma to the temple and stood guard outside his room. Bodhidharma meditated in his room for another four years. Shénguāng would periodically ask Bodhidharma to instruct him, but Bodhidharma never replied. At the end of the four-year period, Shénguāng had been following Bodhidharma for thirteen years but Bodhidharma had never said anything to him. It was winter when the four-year period was nearing its end and Shénguāng was standing in the snow outside the window to Bodhidharma's room. He was chilled to the bone and became furious that his merit was not enough to receive the precious teachings of Bodhidharma. He picked up a great block of snow and ice and heaved it into Bodhidharma's room. The snow and ice made a great crashing noise as it broke on the floor of Bodhidharma's room. This noise awoke Bodhidharma from his meditation and he looked at Shénguāng, who demanded to know when Bodhidharma would instruct him. Bodhidharma answered that he would teach Shénguāng when red snow fell from the sky. Hearing this, something inside Shénguāng's heart changed. Shénguāng reflected on his aggression, which he'd first realized on the banks of the Yangzte river and the aggressiveness of his pursuit for instruction from Bodhidharma. His requests for teaching were of the tone, "I, the great monk of many words is the one to now follow and receive pith (concise) instructions from the great Master." Out of desperation he began crying. His tears froze in the chilled air. Images of the great sacrifices made by past Bodhisattvas flashed through his mind. He took the sword he wielded from his belt and severed his left arm, chopping off his ego in his final act of aggression. He held the amputated arm above his head and whirled it around. The blood from the arm froze in the chill air and fell like red snow. Then, Bodhidharma emerged calmly from his room. "Teacher, I am here to receive your teachings!" Shénguāng declared. Bodhidharma finally consented to take him as a student. "What is it that you want?" Bodhidharma asked. Shénguāng answered, "I seek the Dharma." "Dharma?” asked Bodhidharma. "I have nothing to teach you. I have nothing to say." "But my mind is not at ease," said Huike. "Please, pacify it for me." At this point, Shénguāng was still wracked with guilt for the lives he had taken during his time as an army general. No matter how hard he tried to assuage his guilt by reciting sutras and performing ritual ceremonies, his mind was never at peace. "Bring me your mind, and I will pacify it," said Bodhidharma. Shénguāng turned his awareness inward. He asked himself: Where is my mind? Who is it that is not at ease? Amazed, he said, "I cannot find my mind!" "Then I have already pacified it!" said Bodhidharma. Hearing this, Shénguāng awakened to the empty and peaceful nature of his mind and became enlightened. Shénguāng had been holding onto something: "me" and "my" mind not being at ease. He thought he needed something outside of himself in order to be rid of his guilt, like a meditation technique or a particular teaching. He had hoped to hear an explanation of ultimate truth from Bodhidharma or something else precious or special that would be given to him. But Bodhidharma did not give him anything except the instruction: "If you want your mind at peace, then give me your mind." Shénguāng could not find his mind. Bodhidharma said: "No mind? Then you are at peace!" Bodhidharma took a monk's spade and went with Shénguāng to the Drum Mountain before the Shaolin Temple. Bodhidharma's unspoken message to Shénguāng was that Shénguāng should flatten his heart to match the summit of the Drum Mountain. On the Drum Mountain Bodhidharma dug a well, which filled with bitter water. Bodhidharma left Shénguāng to fend for himself on the Drum Mountain. For an entire year, Shénguāng used the bitter well water to care for all of his needs from cooking to cleaning to bathing. At the end of the first year, Shénguāng went down to Bodhidharma and again asked Bodhidharma to instruct him. Bodhidharma returned with Shénguāng to the Drum Mountain. There he dug a second well that filled with spicy water. For an entire year, Shénguāng used the spicy water to care for his needs. At the end of the second year, Shénguāng returned to Bodhidharma and asked again for instruction. Bodhidharma dug a third well on the Drum Mountain that filled with sour water. For the third year, Shénguāng used the sour water for all of his needs. At the end of the third year, Shénguāng returned to Bodhidharma and asked yet again to be instructed. Bodhidharma returned to the Drum Mountain and dug a fourth and final well. This well filled with sweet water. Shénguāng realized then that the four wells represented periods of his life. Like the wells, his life would periodically be bitter, periodically sour, periodically spicy, and periodically sweet. Each of these phases in his life was equally magnificent and essential, just as each of the four seasons of the year is magnificent and essential in its own right. With a paucity of words, Bodhidharma taught Shénguāng the most vital of lessons in a mind-to-mind, heart-to-heart manner. This mind-to- mind, heart-to-heart communication is called "action language" and is the foundation of the Ch'an Buddhism which Bodhidharma began at the Shaolin Temple. Bodhidharma accordingly gave Shénguāng his dharma name of Huike, which means "Wisdom and Capacity" or "Who is Capable of Wisdom." To show respect for Huike's sacrifice, disciples and monks of the Shaolin Temple thereafter greeted each other using only their right hand. Huike featured in many legends of Bodhidharma. In an alternate tale, it is said that Bodhidharma refused to teach Shénguāng at first. Shénguāng stood in the snow outside Bodhidharma's cave all night until the snow climbed to his waist. In the morning, Bodhidharma asked him why he remained. 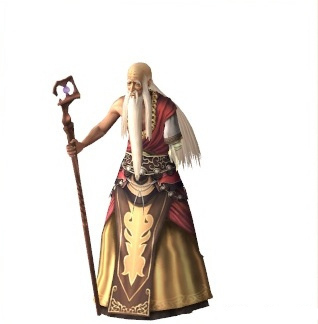 Shénguāng answered that he wanted a teacher to "open the gate of the elixir of universal compassion to liberate all beings." Bodhidharma declined, saying, "How can you hope for true religion with little virtue, little wisdom, a shallow heart, and an arrogant mind? It would just be a waste of effort." 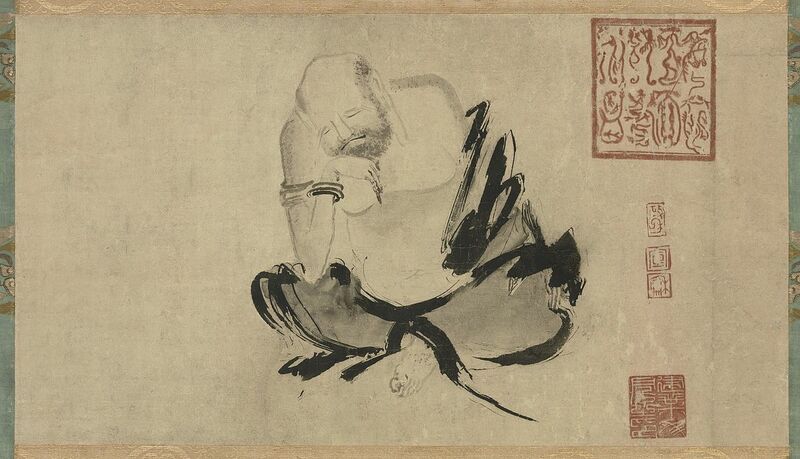 To prove his commitment, Shénguāng severed his left arm and presented it to Bodhidharma as a sign of his faithfulness. Bodhidharma accepted him then and named him Huike. Huike said to Bodhidharma, "My mind is anxious. Please pacify it." Bodhidharma replied, "Bring me your mind, and I will pacify it." Huike said, "Although I've sought it, I cannot find it." "There," Bodhidharma replied, "I have pacified your mind." The Denkoroku biography written by Japanese Zen Master Keizan Jokin (1268-1325) records an account of Huike's awakening when Huike and Bodhidharma were climbing up Few Houses Peak. Bodhidharma asked, "Where are we going?" Huike replied, "Please go right ahead—that's it." Bodhidharma retorted, "If you go right ahead, you cannot move a step." The nun Zong Chi stepped up and said, "It is like a glorious glimpse of the realm of Akshobhya Buddha. Seen once, it need not be seen again." The transmission of dharma (the "right way of living") from Bodhidharma to Huike occurred about 534. That year, the Northern Wei Dynasty that had ruled over northern China collapsed under civil riots and revolts. Northern China was split into two kingdoms. The king of the eastern kingdom established his capital in Yedu, near the present-day city of Anyang in the northern Henan Province. Following his time with Bodhidharma, Huike moved to Yedu about 534 and, except for a time of political turmoil and Buddhist persecution in 574, lived in the vicinity of Yedu and Wei (present Hebei) for the remainder of his life. He attracted many students, but he also angered the Yedu Buddhist establishment. According to the biographer Doaxuan, Huike lost his left forearm during this period. The forearm was severed possibly by bandits or possibly by followers of opposing Buddhist teachers. Northern China also remained tumultuous as dynasties rose and fell. From 557 to 581, most of northern China was ruled by the Northern Zhou Dynasty. Northern Zhou Emperor Wu came to believe that Buddhism had become too powerful, so in 574 and 577 he banned Buddhism in his realm. Huike fled south. Huike hid in the mountains of the southern Anhui Province, near the Yangtze River for an undetermined amount of time. On a mountain named Ssukung Shan there is a stone platform on which it is said Huike lectured and a boulder that marks the place where Huike passed Bodhidharma's robe and bowl to Sengcan, who would succeed him as the Third Patriarch of Ch'an. In 579, a very elderly Huike returned to Yedu to repay a karmic debt. There he resumed spreading the teachings of the dharma as taught by Buddha and Bodhidharma. Huike again drew large numbers of people who listened to his teachings. He again aroused the hostility of other Buddhist teachers. One of these teachers, Tao-heng, hired an assassin to take Huike's life. Huike averted the danger by converting the assassin, though. But one day in 593, a famed priest named Pien-ho accused Huike of heresy. Magistrates had Huike beheaded. One story claims that blood did not flow from his neck, but instead a white milky substance. The Wudeng Huiyan (Compendium of Five Lamps) anthologized by Dachuan Lingyin Puji (1179-1253) claims that Huike was aged one hundred seven at the time of his execution. Huike was buried about forty kilometers northeast of Anyang City. The Tang Dynasty emperor De Zong later honored Huike with the honorific of Dazu ("Great Ancestor"). Like other Da Sheng (Mahayana) Buddhists, Huike practiced and endorsed meditation rather than sutra (sacred writing) commentary, which was favored by Xiao Sheng (Theravada) Buddhists, as the means for achieving Enlighenment. Tao-suan referred to Huike and the other Ch'an patriarchs as dhayana masters, highlighting the importance of meditation during the early years of Ch'an development. However, the form of Huike and Bodhidharma's "wall gazing" or "wall contemplation" (termed by Tao-hsuan as ju shih an-hsin wei pi-kuan) is unclear. ". . . the ignorant and the simple minded, not knowing that the world is what is seen of Mind itself, cling to the multitudinous of external objects, cling to the notions of being and non-being, oneness and otherness, bothness and not-bothness, existence and non-existence, eternity and non-eternity." The Lankavatara Sutra taught the world and our perception of it are both part of a larger conceptual entity and that we should question the existence of the things we think we see. Discrimination between oneself and the rest of the world is false since both are manifestations of the same essence, Mind. Our perception can be easily deceived, so we must not implicitly trust the images that our consciousness sees. ". . . [I]t is like those water bubbles in a rainfall which have the appearance of crystal gems, and the ignorant taking them for real crystal gems run after them .... They are no more than water bubbles, they are not gems, nor are they not-gems, because of their being so comprehended [by one party] and not being so comprehended [by another]." Reality lies beyond these trivial discriminations. The intellect is also unable to distinguish the real from the illusory since all things are both and neither at once. This principle from the Lankavatara Sutra remained at the core of Ch'an even after the sutra was superseded by simpler, more approachable literary writings. A text that circulated during Huike's time was the Treatise on the Two Entrances and Four Practices. The text held the alleged teachings of Bodhidharma with an introduction by T'an Lin (525-543). The entrances allude to the entrance of principle and the entrance of practice. • The entrance of principle is that one must have faith in the truth of the teachings and that everyone possesses the same "true nature" which is covered up by "false senses." • The entrance of practice refers to the four practices of the title: be undisturbed by suffering, accept one's circumstances and be unmoved by good or bad fortune, be without attachment or desire and, finally, govern one's actions based on understanding the emptiness or non-substantiality of all things. Connected to the text are some letters, one of which may have been addressed to Huike and Huike's short reply. The Bodhidharma text and Huike's letter show that the earliest teachings of what was to become Ch'an stressed that Buddha Nature was within, and each person must realize this individually through meditation rather than studying the sutras, performing ceremonies, doing good deeds, or worshiping the Buddhas. Meditation should be free of any dualism or attached goal and realization or Enlightenment occurs suddenly. The tradition of Ch'an Buddhism and Shaolin martial arts are continued in martial arts classes for men, women, and children offered by the Michigan Shaolin Wugong Temple.